I'm all for healthy drinks and foods. Those of you who know me know this. It's not always simple to get a ton of those much needed vitamins and minerals into your system, and some people don't like taking any kind of veggie cap or pill. An easier way to get those vitamins into your system is by opening up a packet of powder and mixing it into your favorite drink. That is just plain super convenient in my opinion! 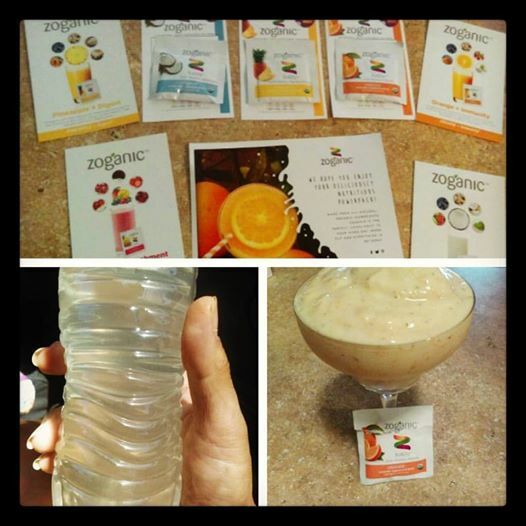 Okay, so I tried a few different flavors of Zoganic Fruitzip over the last couple of days and I liked them all. I've tried multiple powder mixes that caused me to gag or I just couldn't seem to finish the whole thing. This brand is different. This brand tastes good. I love the different flavors that they have available, and yes, you can mix them into a smoothie, shake, juice, tea, etc. You don't have to just drink it with water. My favorite flavor out of all of them is the orange one. The pineapple flavor is made to help with digestive issues such as bloating, heartburn, constipation, and nausea. It has probiotics in it, which are great for adding healthy flora to your gut and keep you healthy. The orange one has antioxidants and boosts immunity. The coconut one has electrolytes in it for hydration. The berry flavor, that I have not tried, has a mixture of berries and is labeled as Multi-Refreshment. -Can be mixed into your favorite drink, even a margarita! 1 Box is full of antioxidants, nutrients, vitamins, probiotics and energy!